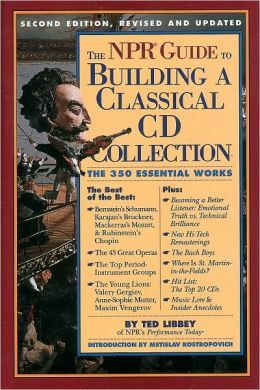 Ted Libbey, author of ‘The NPR Guide to Building a Classical CD Collection’ has a feature on NPR called ‘The NPR Classical 50’. Libbey and host Fred Child discuss popular classical works and have recommendations of recordings. These are short reviews with some interesting antedotes and sound clips from 2009. I have had Libbey’s book for years, and found it overall to be a good primer for those looking to explore the classics. The writing is casual, with a discussion of the works, then various recording recommendations. While I do not always agree with the choices Libbey picks as the best performances, they are all very good recordings, and you will not be steered wrong following his suggestions. Of course many of the listings are out of date, but it is fairly easy to locate the CDs with a little bit of searching.